The AXP209 chip present on the Banana Pi is managing the board powering. 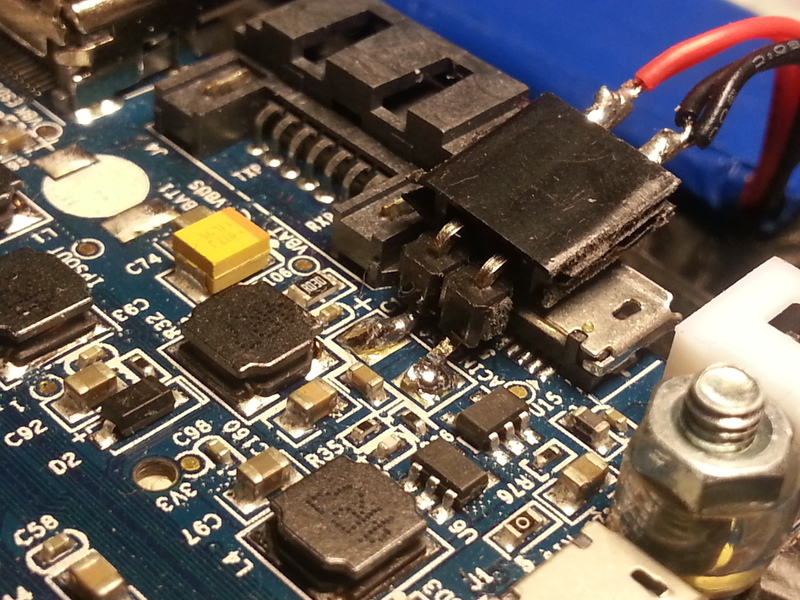 The free pads just behind the power micro-USB allows for a 3.7v li-po / li-ion battery to be installed. So we need some monitoring tools. I’m currently using a 3.7v, 2400mAh Lipo battery salvaged from a lowcost tablet. It should also work with 3.7v Li-ion batteries without modification. I also had to change each « and » in the above code to a plain » (Thanks, WordPress…). I’m thought I’d leave this here in case it helps someone else! … that is, I had to change them to a plain double-quotation mark. I am officially giving up on trying to type the symbol I’m talking about! Je suis désolée! On the banana you could use : cat /sys/class/power_supply/battery/uevent. It’s easier … Isn’t it ? You’re right, there are easier methods to read the AXP209 status, including reading a few files. I will update the blog article when I have a new script to share.